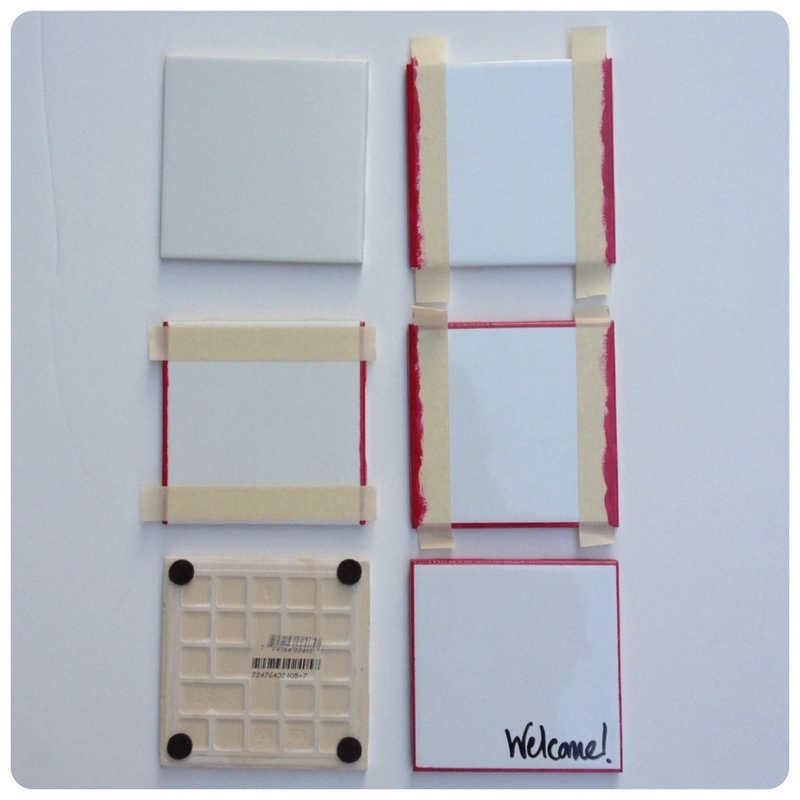 I don’t venture into the DIY world very often, but the idea for dry erase coasters has been in my journal for months and I finally got around to making it happen. I like anything that can help engage my guests while also being reusable and, if I am making it, it needs to be quick and easy. Write a fun fact, a question, or even a game of tic-tac-toe at your next soirée. The possibilities are endless. Step 1. Tape two opposite sides of the tile leaving a small line exposed. Step 2. Paint both the side and small top line of tile with two coats (just like your nails) and let dry. Step 3. Remove tape from painted sides and tape remaining two sides. Step 4. Repeat painting process and let dry. Step 5. Stick four felt pads on the bottom corners of each tile. Step 6. With a dry erase marker write or draw away! Such a simple and awesome idea! Oh I love this! And using nail polish is savvy because it gives you a ton of unique color options and you can use what you already have at home. When I get my new apartment, I’m definitely making these! Such a cute idea! Love adding the nail polish. It’s such a nice finish to such fun project! Thank you! Would love to see what color combos you come up with. How well does the nail polish stay on the tile after being used? I was just curious if you put any sort of top coat on the paint to seal it in? I have used them a few times without any top coat and haven’t had any chipping. A top coat of clear couldn’t hurt!